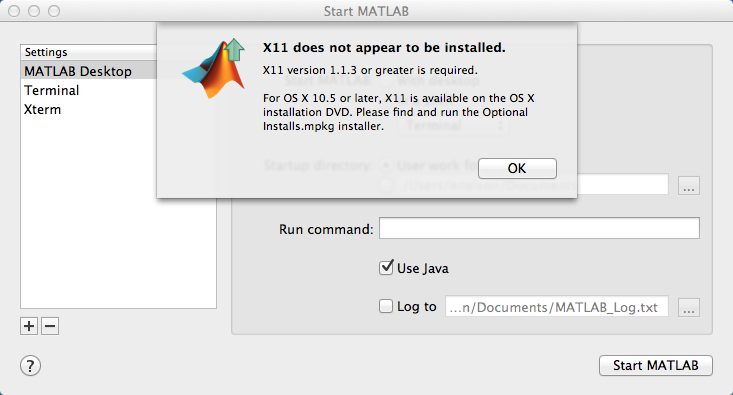 Matlab 2008b has some issues when being installed on Apple OSX Mavericks. This post will guide you to the most simple way to get it running. This can be improved, but not fixed, by installing XQuartz. This is described by Mathworks in their article here on X11 and XQuartz. You now will be able launch Matlab with a command line like the below within a XQuartz shell. This issue is described here and has some possible fixes including installing different versions of Java and messing with you OSX internals. I wasn't ready to dive into that, but luckily found a much simpler way to resolve this problem. It seems that this Java problem is only a problem with the code dealing with registration. The application is actually all ready to go. It just needs a license. You can login to the Mathworks website and see all of your existing purchased licenses and download a license.lic file. You can even likely register a new license through the website and get the file you need. The process just requires you to put in the MAC address of your computer - the process is described here on how to do it on Mavericks, but the short answer is to do the following command. Which will give you the MAC address of the correct ethernet device. You put that into Mathworks website to give you license.lic file. Then you can open up the Matlab Package Contents for Matlab from Finder and put the license.lic file in the right spot. After putting the license file in the right spot and launching Matlab from XQuartz you have a very old copy of Matlab working on Mavericks!